Hello, Students! Welcome to the real stuff. Your first moment of Astro calculation. That listing will tell you the exact location of your North Node in degree, sign, and minute. Example: 12 SAG 18, means 12 degrees, 18 minutes of Sagittarius. 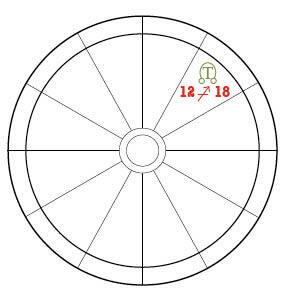 The North Node symbol will be depicted on your chart wheel drawing in one of the 12 houses. The symbol looks like a tiny upside down “U” with curly cue ends, shown here in blue. On an Astro.com chart the “U” will have a “T” inside it, like the green version here, to indicate it’s using the “True” node calculation. Okay, get ready, here’s the calculation part. Look at your Natural Zodiac pdf. (Here, if you need). See the 1st house, 2nd house, so on. You are now going to determine in which house on your personal chart your North North node is located. Starting with the 1st house, with the ascendant, which is in the same place on your chart as it is on the Natural Zodiac chart, count the number of pie wedges to your North Node. First house is 1, 2nd house is two, 3rd house is three, etc. This number is your North Node’s house location. It is important. Say it’s the 8th House. Shown here, with the 12 SAG 18 example, with nothing else on the chart so you can see it. In the Nodal Path descriptions below, you will be reading about North Node in the 8th House. Doesn’t matter what the sign is, your North Node being in the 8th House means you will be learning 8th House lessons. 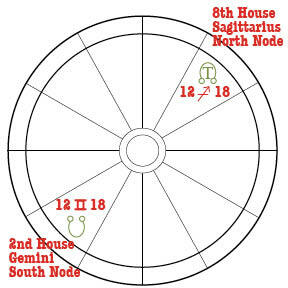 Even though it’s not drawn on your Astro.com chart, in this example, the 2nd House is where your South Node is located. Again, very important. (And if you got your chart somewhere other than Astro.com, the South Node may actually be drawn in. It’s symbol, appropriately, is the mirror opposite of the North Node. Now we know your Nodes’ House placement. Next, we’re going to determine the sign of your South Node. Continuing with this example, what is the sign that is opposite Sagittarius? Look at the Natural Zodiac chart. Find Sagittarius (Hint, it’s the 9th House). What is the sign directly opposite Sagittarius in the 3rd house? (Math: 9-6=3) Yes, Gemini. So in this example, your South Node is at 12 degrees, 18 minutes of Gemini. Which means, in this example, you would be on the Sagittarius North Node/Gemini South Node Path. As well as the 8th House North Node/2nd House South Node Path. 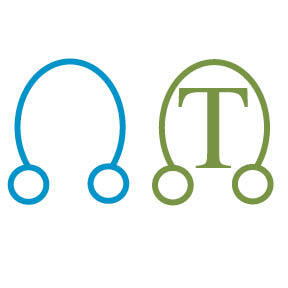 When you read the Nodal Descriptions, remember you will read two: One for the signs of your nodes, one for the houses. So, equipped with your nodal placements, let the freedom begin! Here are the brief introductory descriptions of the Moon’s Nodes 12 Journeys.